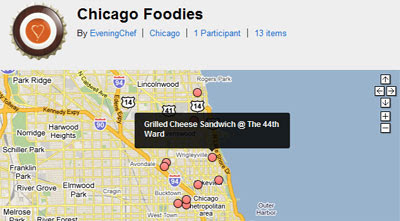 Foodspotting is a social sharing website that lets you find dishes instead of just restaurants. Users can share information about food dishes they have liked and search their neighbourhood for dishes recommended by other users. The local neighbourhood maps show the locations of shared dishes (and the restaurants where you can buy them) with Google Maps. Photographs of the dishes are displayed beneath the map. Clicking on a map marker will take you to a dedicated page for that dish. Foodspotting is available as an iPhone app so that you can discover or share dishes whilst you are out and about. The application allows you to take pictures of dishes and earn badges for your submissions.